My friends and family who know me well may be surprised to learn I am super picky when it comes to my preferred writing instrument. Finding a pen I like used to be an ongoing conflict — especially at the office. It seemed that as soon as I discovered a tolerable option, it was no longer available in the supply closet and I was forced to expand my horizons and use other, non-preferred pens. And don’t even get me started on ink color. Yes, people, the struggle was real. Or, it was — until Paris. In June I was lucky enough to attend a writing retreat hosted in the amazing City of Light. 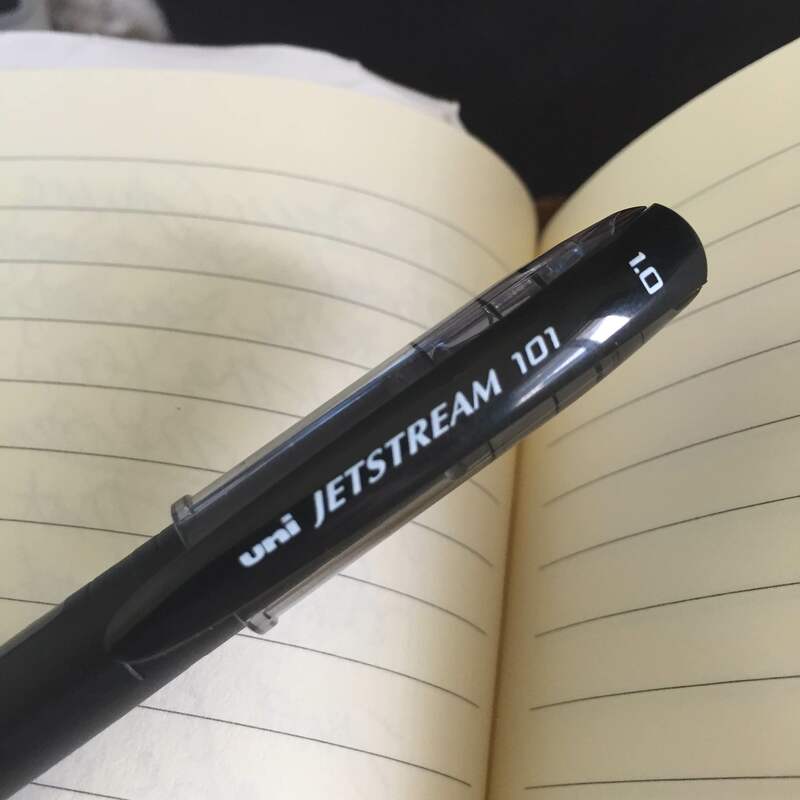 And, as part of the Penning in Paris welcome packages, our thoughtful retreat leader included the uni-ball Jetstream 101 in black ink. Cue me falling in love — hard — for a pen. Maybe it was the settings (e.g., Luxembourg Gardens, Eiffel Tower, Le Deux Magots) or the writing prompts or my amazing retreat friends or the fact that I was in Paris on a week-long writing retreat, but I honestly have to give some props to this rollerball for the fact that I filled roughly 50 pages in just a few days. The pen writes like a dream, is smear resistant and is super comfortable, even for marathon-writing sessions. And, while uni-ball offers the Jetstream in a number of variations, my alliance is with the 101. 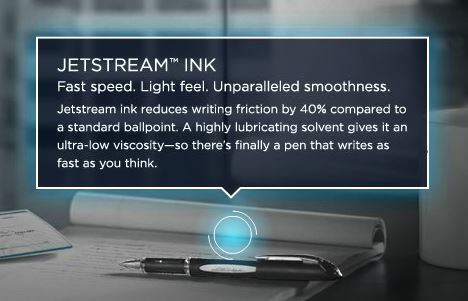 According to the good folks at uni-ball, the Jetstream is “engineered to keep up with even the fastest flow of ideas.” Anyone else swoon over that description? No, just me? Also, I’m not alone in my love for uni-ball’s Jetstream. I discovered numerous reviewers who lauded the pen for its performance, affordability and ease of use to purchase (re: they’re available basically everywhere). The pen also made it on nearly every top-pen list I found. I’d recommend this review and this blog for those who want more details about the pen and pens in general. So, what does one do when they find a product they REALLY love? They buy boxes and boxes of said product. Okay, maybe not boxes and boxes, but I definitely now have approximately 50 of these fine pieces of plastic + ink at my home. And, while I realize this purchase goes against my efforts to declutter, these pens definitely fall into the category of sparking joy, so I’m letting it slide.Plus, they’re pretty cheap, at about $15 for 12 pens. 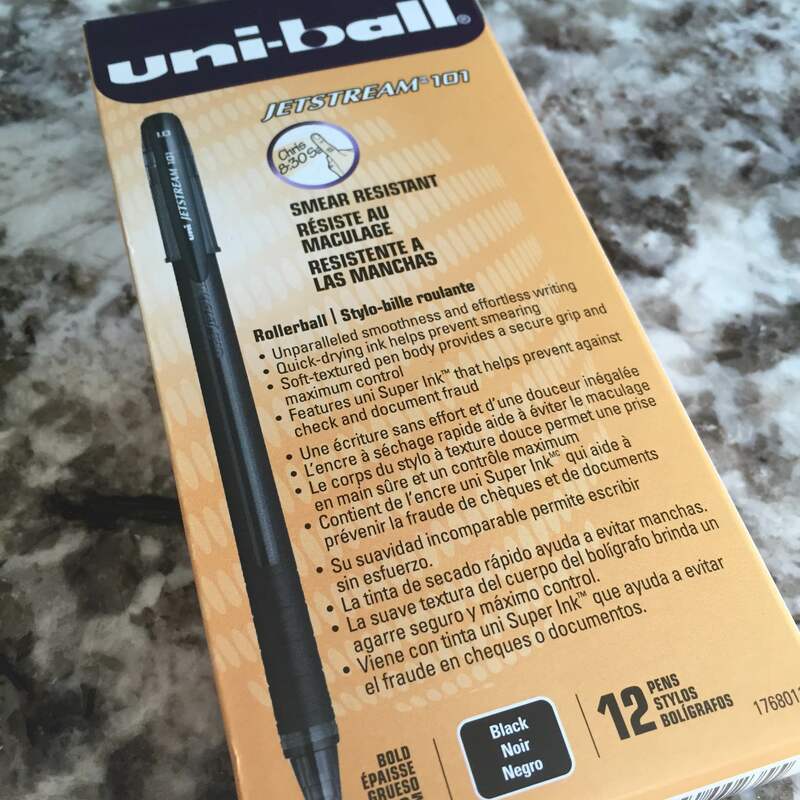 So, this week I pay homage to the uni-ball Jetstream 101 — in black ink, of course — as the thing I’m loving. Now, I’m going to ask you all to keep me in your thoughts when it comes to uni-ball continuing the production of this pen. I’m not sure I could tolerate another incident like a particular cosmetic company ceasing production of my favorite mascara. Because that, my friends, was a near tragedy. Anyone else as picky as I am when it comes to pens + have a favorite writing instrument?